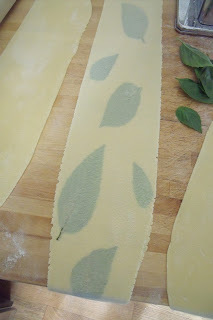 what's cooking in my tuscan kitchen: Tired of the same old noodle?? Tired of the same old noodle?? Well! It has been a long, hot summer here in Lucca with temperatures in the high nineties and even 100° for the last 2 and a half months! I really do not do well in the heat... and so I have sorely neglected my blogs and have been spending most of my time sitting on my sofa in my cool living room knitting! But the temps are down and today while I was making some tagliatelle for lunch I decided to experiment with "decorating" my pasta! It is really quite simple... after you have rolled out your pasta to the thickness you want, arrange some basil leaves (or parsley, or sage or any other herb leaf) on half of a sheet of pasta. I discovered that this works best if the leaves are face down, if they are face up they tend to curl. 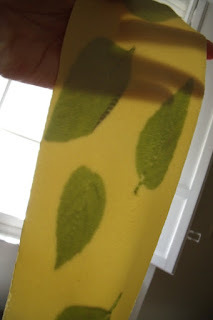 Then fold the other half of the sheet over the leaves, gently tamp it down and pass the folded sheet through the rollers of your pasta machine one or two more times on the same thickness. The result is beautiful!! 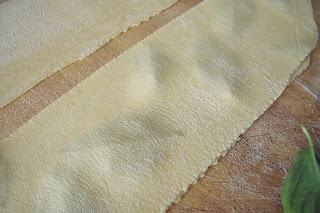 I went ahead and cut the sheet into tagliatelle, but you could use these sheets of pasta to make beautiful first dishes. You might want to try cutting them in 6" - 8" lengths. Then gently boil, spread with a ricotta filling, roll them up and bake in a hot oven 400°F for about 10 minutes to set the filling and serve with a cream sauce and freshly grated parmigiano cheese or even with a delicate tomato sauce. Or you might try making a vegetable lasagna with a light bechemel sauce. I am thinking about trying this with edible flower petals! Rose, violet or nasturtium petals in a variety of colours in tagliatelle served with a delicate shrimp and cream sauce. Sounds delicious to me! Here are a few photographs illustrating the steps. Roll out your pasta to the thickness you want. Arrange the leaves FACE DOWN on half of the sheet - I took the photo before I realised that they would curl and I did turn them over before proceeding. It's too pretty to hide in lasagne. So lovely! I like the idea of petals and cream sauce. But I may have to make sage. Yum. And then with a toss of roasted squash cubes? sounds delicious! I think that a light butter and wine sauce or a light cream sauce would be perfect with the safe and squash! I was thinking after I made the tagliatelle today that it would be neat to cut the pasta in largish squares so that there is a leaf in each square... next time will try it . Here in lucca they make "quadrettoni" - large squares of homemade pasta about 2" squareand they serve them with ragù. 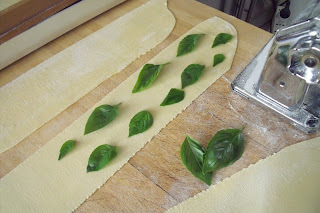 why not make them with the sage leaves in them and toss with cubed squash! ?